Super Seal Corporation was founded in 1971 by a GE chemical engineer widely regarded as a leader and innovator in the fields of cross linked polyolefin and electrical resistant compounds. With this strong technical background the company began producing heat shrinkable protective end seals out of its manufacturing plant in Bridgeport, CT. Due to the company’s success and growth, in 1985 Super Seal Corporation moved to a larger and more modern manufacturing facility in Stratford, CT where it continues today as an industry leader in the supply of heat shrinkable end seals serving the wire and cable industries. For over 40 years Super Seal has been providing high quality heat shrink end seals used to environmentally protect and insulate wire, cable, pipe, conduit and roping. 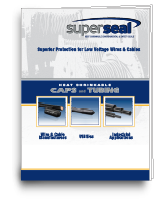 In 2006 Super Seal Corporation expanded its product line to include heat shrink low voltage tubing and heat shrink repair wrap sleeves in addition to its line of heat shrink end seals. With this wide range of products, Super Seal Corporation meets the heat shrink needs of electric utilities, national distributors, electrical wholesalers, OEM’s and industrial contractors across North and South America. Super Seal maintains a large inventory of heat shrink products in a wide range of sizes, enabling the company to meet the Just In Time needs of its customers. Over 90% of the company’s products ship the same or next day regardless of the order size. In addition to the company’s wide range of standard products, Super Seal customizes heat shrink products to meet any unique design requirements a customer requires, making Super Seal Corporation the ideal supplier for all your heat shrink needs.